Thanks to a boom in gold mining, the small Nevada town has been cruising through the downturn. 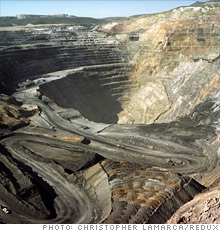 An open-pit gold mine operated by industry giant Newmont Mining. Curtis Calder, Elko's city manager: "Elko is the best place in Nevada to be." ELKO, Nevada (Fortune) -- At a time when local officials coast to coast are frantically slashing municipal budgets, furloughing employees, and trying to soothe recession-wounded constituents, Curtis Calder, the city manager in Elko, Nev., has a hard time coming up with much to worry about. Indeed, the economic news in this community of 19,000 is astonishingly cheerful: Housing prices are stable. Commercial building is up. Tourist events are drawing bigger crowds than last year. Unemployment is about as low as you'll find. The casinos are down only slightly. And the town's four legal brothels are having a busy summer. "Elko is the best place in Nevada to be," says Calder with a burst of exuberant confidence that would make any civic booster proud, "and maybe in the whole country." What's the secret of the city's success? Gold. Lots and lots of it. The mile-high land around Elko in the barren northeastern corner of the state contains a treasure trove of invisible specks of gold. Dug from open pit mines, tons of ore are put through a complex leaching process to extract the precious metal. Nevada has the largest deposits of gold in North America, most of it in the Elko area. It ranks fourth in production in the world behind Australia, South Africa and China. With the price of the precious metal not far off its record high at $950 an ounce, this is a modern -- if more modest -- version of the bonanza that transformed California in 1849. "Gold is a boom and bust industry," explains Calder. "When the rest of the economy drops, the price of gold goes up. We're pretty vibrant right now." Elko was essentially a cow town until geologists found the ore (sometimes reddish, usually gray) in the hills outside neighboring Carlin in the early 1960s. The gold here isn't in the form of nuggets as in California, but what is technically called "disseminated submicroscopic gold." Armed with new technology for recovering the metal, the two biggest gold mining companies in the world moved in -- first Newmont Mining (NEM, Fortune 500), based in Denver, and later, Barrick Gold (ABX), a Canadian firm with headquarters in Toronto. The mining process in Elko is a long way from panning in a stream. Simply put, extracting the gold involves grinding the ore into a powder, sometimes subjecting it to intense heat, and then percolating it with a weak cyanide solution. At the end of this process, the invisible specks become molten gold, which is poured into bars called dor�s. These bars are the size and shape of a loaf of bread and weigh about 60 pounds. They're transported by armored trucks (on a secret schedule to prevent hijacking) to refiners who produce bullion and sell it to banks and investors as well as manufacturers of jewelry, dental products, and electronics. The median family income here is $68,000, highest in the state. With overtime, an unskilled worker just out of high school can easily earn that much. "My older boy got into six figures, $105,000 one year," says Elaine Barkdull Spencer, executive director of the Elko County Economic Diversification Authority. "He was making more money than I was. I say, God bless mining." Unemployment is fluctuating around 6%, about half what it is in Las Vegas and Reno and well below the national average. The figure would be even lower if not for a recent influx of unemployed people looking for work. A year ago Elko's unemployment rate was an almost non-existent 3.5%. Sales tax receipts for the year in the state are down a worrisome 11.9%; in Elko county, they've fallen only a third as much. Before the gold boom, Elko's main claim to fame was as a transportation hub. It was founded in the 1840s as the main stop between Salt Lake City and Reno on the transcontinental railroad that united east and west. The California Trail, a popular route for wagons traveling west in the mid-1800s, passed through Elko, and the ill-fated Donner party stopped here briefly before heading for tragedy in the mountains ahead. The Union Pacific railroad still has a sizable main yard outside town, with switching and maintenance crews and a base for its employees. There's a long tradition of ranching in the area -- both for pleasure and profit. In 1943, singer Bing Crosby bought a ranch in Elko County as a healthy place to raise his sons and five years later, he was appointed honorary mayor of the town, a position he held until his death in 1977. Today Elko is one of the top ten counties in the nation for livestock production. 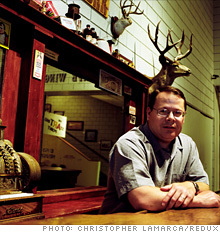 But it's Elko's wide variety of tourist-oriented events that give the town a special flavor. In January the weeklong National Cowboy Poetry Gathering brings in a huge collection of bards, storytellers, filmmakers, and musicians. In mid-June, some 7,000 bikers roll in to town for the Motorcycle Jamboree. And the National Basque Festival (affectionately known as the "Basco Fiasco") over July 4th weekend celebrates the Spanish immigrants who came here from the Pyrenees in the 1860s and 1870s to herd sheep. Another big draw in the summer is the annual Mining Expo, one of the biggest and oldest of its kind in North America. It gives manufacturers a chance to show off their massive new machines for all kinds of mining, not just gold. Autumn brings a hot air balloon festival and the hunting season. When visitors aren't admiring a new steam shovel or shooting mule deer, they're usually found in one of Elko's three major casinos (slot machines and table games) and four smaller ones (slots only). Because these out-of-towners have presumably not escaped the recession back home, the amount they are betting these days in Elko, says David Zornes, CEO of the Red Lion hotel and casino, the largest in town, "is down about 6%." Elsewhere in the state, the situation is dire. According to the Nevada Gaming Board, gambling is off 16% in Las Vegas, 23% in Reno, 34% in South Tahoe. Elko has one other tourist attraction that is surviving the recession nicely, thank you -- its brothels. Bordellos are legal in Nevada in cities with a population of less than 400,000 (eliminating Reno and Vegas). Elko's four houses -- Inez's Dancing and Diddling, #1 Geisha, Mona's Ranch, and Sue's Fantasy Club -- are all clustered around an intersection downtown and employ a total of about 20 "working girls." Business generally heats up with the weather. "It's like high season for us in the summertime," says Victoria, the madam of Sue's Fantasy (who declined to give her last name). "The mining expo is a lot of business." The houses are carefully monitored by the city. The women, who are from all over the U.S. and even overseas, must obtain work permits and submit to weekly medical exams. Inside each brothel there are signs warning in English and Spanish that condoms are required. They only accept male customers and the minimum age for admission is 21. The women are all "independent contractors" and set their own fees. Sue's Fantasy Club has a $100 minimum, but as Victoria acknowledges, "for some girls, that's only a striptease. Other girls won't take anything less than $500." Victoria has strict rules about the women she hires. "No tattoos, no body piercing, no stretch marks, and no drinking at the bar unless there's a guest here," she says. "These are professionals." Although the customers are "50-50, local and tourist," according to Kathy Hill, bartender at Mona's Ranch, Elko as a community seems to shrug off the presence of the brothels. "Unless you've been in town for a while, you may not even know they're here," says police chief Don Zumwalt. Despite all the good news in Elko, there is some understandable caution. "Even though our economy is strong and stable," says Mayor Mike Franzoia, a local businessman, "people read what's going on elsewhere." Not only that, but it doesn't take a very long memory for locals to recall what happens when the price of gold falls. It happened last between 1999 and 2003 and the results were not pretty. Gold plummeted into the $200s, the mines cut back, and the city had to reduce payroll and services. That experience is the driving force behind a major effort to diversify Elko's economic base and lessen its reliance on gold. In 2008, the town adopted its first redevelopment plan. Now a diesel repair shop and an extra wing on a retirement community are going up. At the airport, a handsome corporate jet facility, El Aero, recently opened for private flights, mining and otherwise. A new tourist attraction, the California Interpretative Center, devoted to the California Trail and the families who passed through Elko, is under construction beside Route 80 west of town. To provide housing for visitors and temporary workers, three long-term rental hotels -- from companies like Marriott, Hilton, and Candlestick Suites -- will be built this year. But the pet project of Spencer, the economic development chief, is taking shape five miles west of town on 800 acres of former ranch land: the $15 million Northeastern Nevada Railport. Located just off the Union Pacific main east-west lines, it offers 19,000 feet of track for on- and off-loading and warehousing of commodities like fuel, lumber, mining supplies, ore, etc. Small companies allied with mining -- metal fabrication and steel recycling -- are already building at the railport. And other companies not dependent on gold (like bottling and paper towels) are interested, says Spencer. The facility will open this fall and could eventually employ 800 to 900 workers who will live and shop and pay taxes in the Elko area. "We thought it would take 20 years to attract businesses to this land," says Spencer. "It'll be [fully developed] in five years." For Elko, that kind of self-reliance is part of its frontier history. "Think about it," says city manager Calder. "We have cowboys, Indians, gold, gambling, and legalized prostitution. We're still part of the Old West. We want to hang on to that tradition and combine it with modern day economic realities. We want to make our own destiny." The mining boom gives them a golden opportunity.